The dill is taking over the greenhouse and in the last week I've been pulling the plants up before they flower and set more seed to perpetuate the problem. In the process I noticed that there were some black swallowtail caterpillars on some of the plants. I made sure that I left those plants in place. 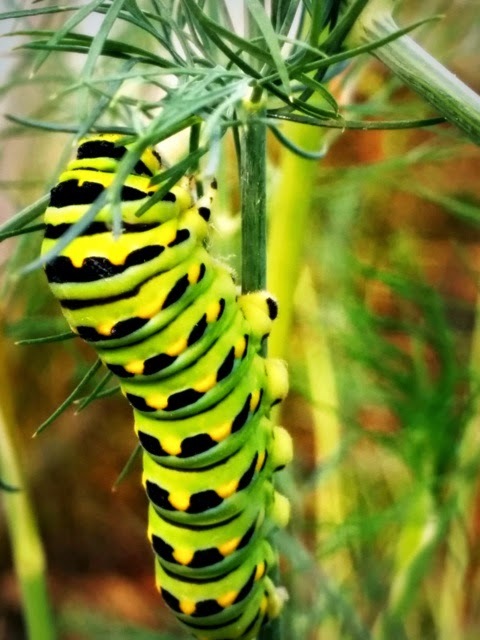 It's quite amazing to watch how rapidly the caterpillars will chomp their way through a frond of dill. But I think it would take a lot more than half-a-dozen of these creatures to deal with my superabundance of dill. We became citizens of Canada just a week or two after the last Ontario elections and there hasn't been an election at any level of government since then. Today's Ontario election was the first time I have had the opportunity to vote in this country. It's something that's easy to take for granted, but after living here for seven years without a vote, I have come to realise how important it is to have that small role in a democracy. When I didn't have it, I felt excluded from a significant part of local, provincial and national life. Our polling station is 10km (6 miles) away - so it's not like being in a city where you can just stroll down the road to cast your vote. 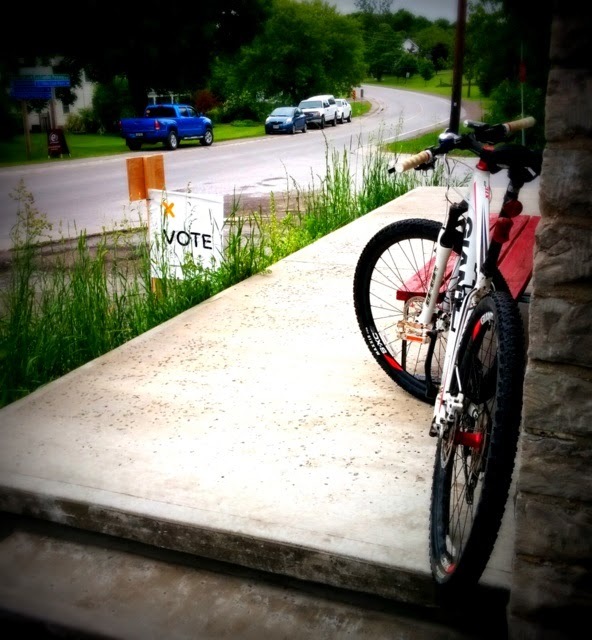 I decided to make an event of it and rode my bicycle to the town hall in Hillier. It's a nice route, as much of it is along the old railway line and consequently it's fairly flat (important as this was also my first bike ride this year. Shameful, I know!). 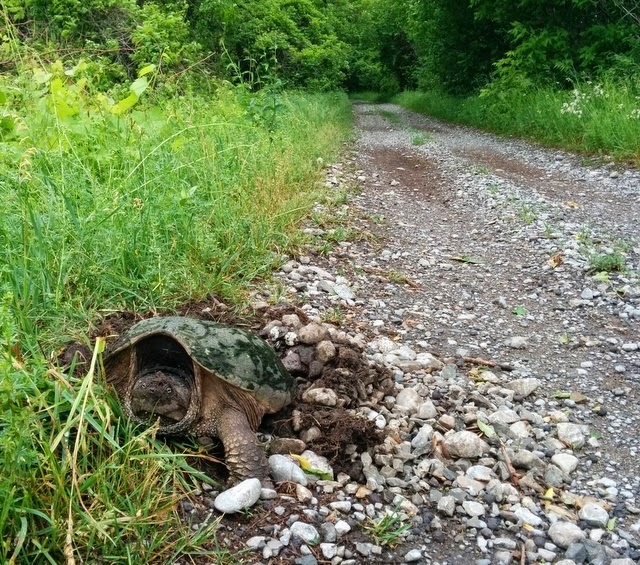 In one short stretch of my journey I encountered three separate snapping turtles, all scraping out hollows along the edge of trail and laying eggs in the depressions. Definitely not something I've ever seen while going to cast a vote in England! I spent an informative and enjoyable two hours exploring the Quinte Conservation Area today in a small group led by Tamara Segal of Hawthorne Herbals. She walked us around the Creekside Loop Trail and talked about a huge range of wild plants, some native, some European invaders, and their uses as both food and medicines. Just for my own benefit, here's the list of plants we heard about: wild sorrel; wild grape; wild strawberry; mullein; motherwort; plantain; nettles; wood nettles; garlic mustard; sumac; linden; ground ivy; parsnips; wild geranium; burdock; elecampane. I had no idea that parsnips have become naturalised here - I've not spotted them in the wild before, but they were all over the place at the conservation area. Because it is a conservation area, we didn't actually do any harvesting, but I know quite a few of these plants are growing around our place and will now keep an eye out for the others! 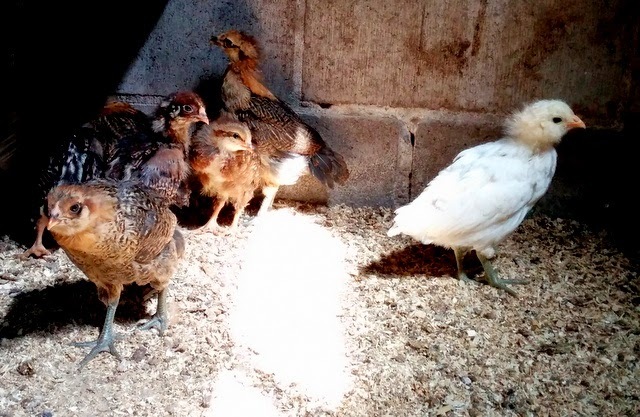 The white Ameraucana one draws the eye, as she's so different in colour from all the rest. She also seems to be a bit more feisty than the other chicks and the most likely to start a fight! I'm conscious that it's been a bit quiet on this blog for a few weeks. Mainly this is because this is such a busy time of year in the garden. 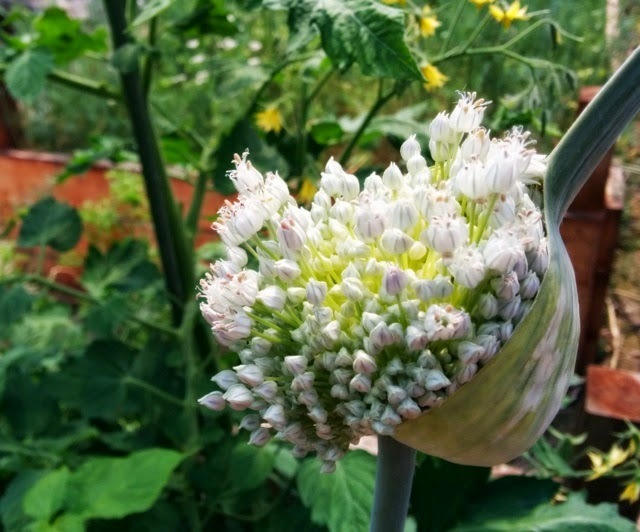 I've been sowing and planting and weeding like a possessed thing - and the weeds are still winning. We had some welcome rain on Tuesday. I didn't really get dry all day, but that was my fault for spending far too long trying to get photos of flowers bedecked with raindrops. The greenhouse beds are mostly under control and producing tremendous quantities of dill, coriander/cilantro and lettuce leaves. The potatoes popped up overnight. I've got some in the greenhouse because I had too many for my potato bed. As usual, I have vast quantities of tomato plants. I sold about a third of what I grew. I planted about 20 plants in the greenhouse a few weeks ago and finally finished planting the remainder outside this week. The greenhouse ones are starting to flower now. I still have about ten jars of tomato sauce from last year, so with any luck I will run out just as I start to pick this year's crop.